Columbia Mountain Cabins is a great place for those desiring a quiet place off the highway. Built in 1991, the cabins each offer a kitchenette with all the utensils, a barbecue grill, and a picnic table. In addition, we provide a fully-furnished kitchen for reunions. 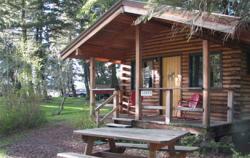 There are 5 cabins situated within 400-year-old tamarack and ponderosa pine trees. Each cabin has a view to the open pastureland, Columbia Mountain or the trout pond. A separate building provides full kitchen services, laundry and separate restrooms/showers for men and women. Linen and bath towels are provided at no extra charge. You won't hear any traffic here! It may be so quiet you'll have trouble sleeping! We are Christian owned and operated. Directions: Columbia Mountain Cabins is convenient to area attractions. It is located one mile south of the junction of Highways 206, 2 and the Big Sky Waterslide.